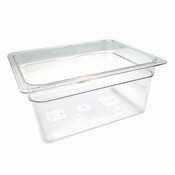 The Carlisle 10201B07 Full Size, 4" deep, polycarbonate food pan is a multipurpose food storage and presentation solution. Use the 12.7 quart pan in the kitchen for collecting or assembling fresh cuts and ingredients or to display finished foods and toppings at a buffet station. The temperature range (-40°F to 212°F) makes the pan ideal for freezing and warming applications. Molded-in capacity indicators (quarts and liters) display measurement and facilitate portion control. The pan is made of chip, crack and stain resistant polycarbonate plastic. Reinforced edges and corners endure daily stacking and bangs of professional use. The smooth rounded interior makes every scoop count and reduces food waste. The textured exterior edges resist scratching and offer improved handling. The pan is stackable for convenient storage. It is also compatible with Carlisle StorPlus Universal and Smart Lids (sold separately). The pan adheres to universal gastronorm catering industry size standards. It is NSF Listed and dishwasher safe. 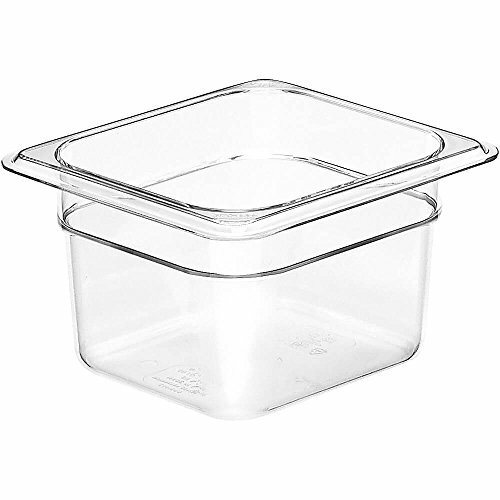 The clear food pan has overall measurements of 20.75 x 12.75 x 4 inches (L x W x D). The Carlisle 10271U07 Third Size, polycarbonate universal handled notched food pan lid completes the Carlisle food pan solution for every food serving and presentation need. The temperature range (-40°F to 212°F) is ideal for freezing and warming applications. The built-in peg hole facilitates hang drying and storage. The special rim design stabilizes stacked food pans. The exterior textured surface reduces scratching. Polycarbonate plastic resists chipping, cracks and unsightly stains from food acids and oil. Lid is compatible with Carlisle StorPlus Food Pans (sold separately) and adheres to the universal gastronorm catering industry size standards. For a leak-resistant lid use Carlisle Smart Lids (sold separately). The clear lid is NSF Listed and dishwasher safe. It has overall measurements of 12.75 x 7 x 0.88 inches (L x W x D). Approx. Capacity: 3.8 Qt. 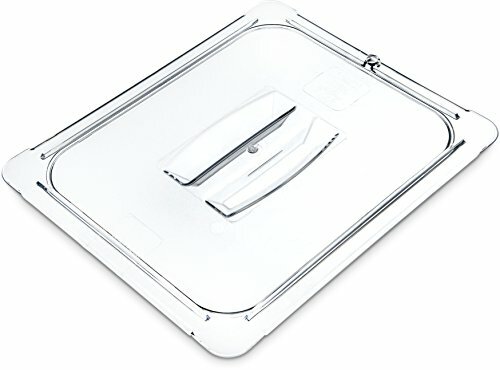 At just half the price of stainless steel, Camwear Food Pans are extremely cost effective. Yet, the virtually unbreakable polycarbonate construction ensures that they won't crack, bend or dent. These food pans withstand temperatures from -40 deg. F to 210 deg. F and have both standard and metric graduation markings to promote easy inventory management. Precisely designed to Gastronorm GN specifications, Camwear Food Pans deliver three-in-one service: storage, transportation and serving display. Non-stick smooth interior surface increases yields and promotes easy cleaning. They stack neatly, without wedging or sticking. Uniform 1/2 in. flange width ensures a smooth fit for prep tables and rails. 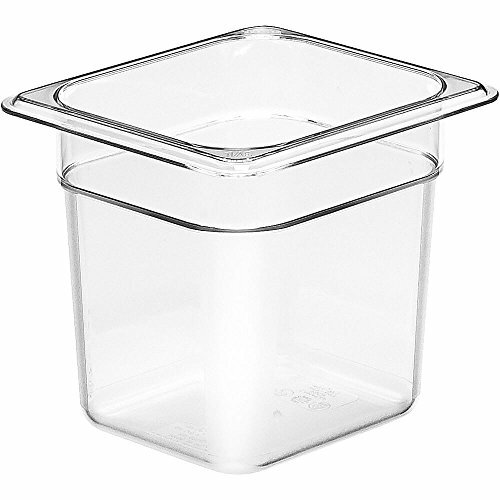 Covers and Cambro's exclusive FlipLid and GripLid (sold separately) eliminates spillage when storing or transporting. Case of 6. 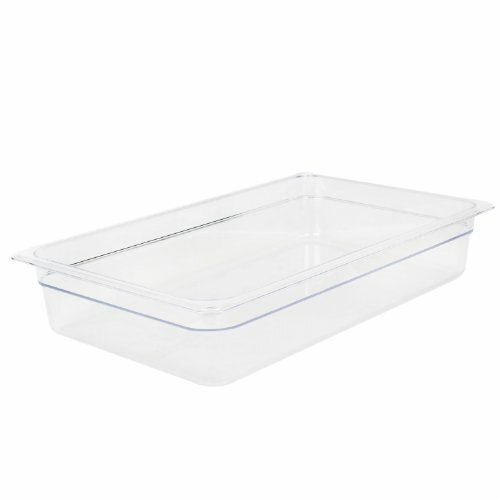 The Carlisle 10230U07 Half Size, polycarbonate universal handled food pan lid completes the Carlisle food pan solution for every food serving and presentation need. The temperature range (-40°F to 212°F) is ideal for freezing and warming applications. The built-in peg hole facilitates hang drying and storage. The special rim design stabilizes stacked food pans. The exterior textured surface reduces scratching. Polycarbonate plastic resists chipping, cracks and unsightly stains from food acids and oil. Lid is compatible with Carlisle StorPlus Food Pans (sold separately) and adheres to the universal gastronorm catering industry size standards. For a leak-resistant lid use Carlisle Smart Lids (sold separately). The clear lid is NSF Listed and dishwasher safe. It has overall measurements of 12.75 x 10.38 x 0.88 inches (L x W x D). 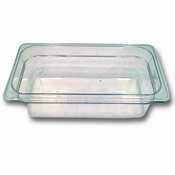 Excellante half size 6 Inch deep polycarbonate food pan. 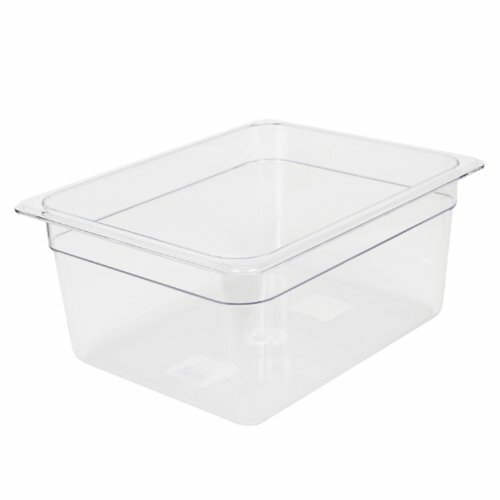 The polycarbonate food pan is shattered resist and resists acid and oil corrosion. They are easy to clean and dishwasher safe. These pans can withstand temperatures of -40 degrees F to 212 degrees F. Lids and drain shelves are sold separately. It is also NSF approved. 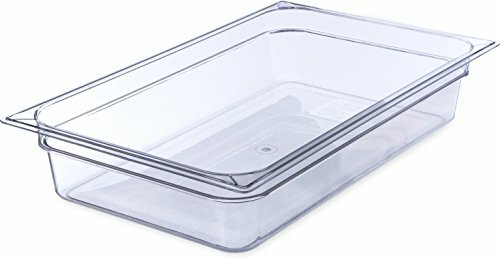 Compare prices on Polycarbonate Food Pan at Shopsimal.com – use promo codes and coupons for best offers and deals. We work hard to get you amazing deals and collect all avail hot offers online and represent it in one place for the customers. Now our visitors can leverage benefits of big brands and heavy discounts available for that day and for famous brands.